This series is so much fun! I’ve written lengthier reviews of the first two Veronica Speedwell books (A Curious Beginning and A Perilous Undertaking), so I’ll keep this one brief. 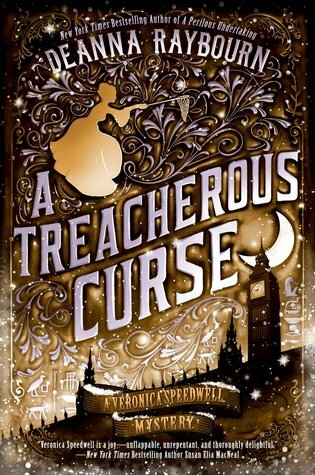 Veronica Speedwell, a (mostly) proper Victorian lady with a penchant for butterflies, scientific expeditions, and hot men, once again becomes embroiled in solving a mystery in order to stave off potential disgrace for her partner Stoker. The plot involves a mummy’s curse, shady explorers, Egyptian gods… and perhaps most importantly, figures from Stoker’s dark past. The mystery itself is quite fun, and it’s satisfying to get some of the answers we’ve been waiting for about Stoker’s dismal reputation and the scandal that haunts him. Veronica and Stoker still have that red-hot (but unfulfilled) chemistry between them, and the door is definitely open for further adventures and further romantic entanglement. Veronica is a terrific heroine, and the books in the series feature just the right combination of danger, adventure, and witty dialogue. Highly recommended! Thank you! I haven’t read the Julia books, but I’m planning to dive in this year!